‘Let him batter away,’ says the Armagh boss. KIERAN MCGEENEY HAS laughed off RTÉ pundit Joe Brolly’s criticism of him following the county’s Ulster SFC defeat by Cavan. 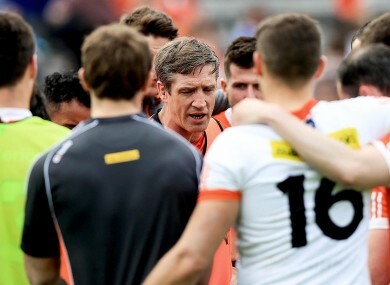 Brolly caused controversy with some scathing comments about the Armagh boss in the wake of his team’s first round loss at Kingspan Breffni Park 12 days ago. Speaking for the first time since Brolly’s rant on ‘The Sunday Game’, McGeeney shrugged off the remarks and media circus which followed it. “I am flattered by Joe’s obsession with me,” he quipped. “The more you talk about him, the happier he is. That’s what it’s all about. McGeeney and Brolly shared the same dressing-room in 1993 winning a Sigerson Cup together with Queen’s University. In a stinging attack on ‘Geezer’ on May 29, Brolly said that being a great player wasn’t a qualification for being a great manager, and made unfounded claims about Armagh’s players playing minimal club football. He said McGeeney “hasn’t a clue” and alleged some Crossmaglen players didn’t want to play for him, a claim later rejected by star forward Jamie Clarke. When asked if Brolly’s comments had upset him, the 2002 All-Ireland winning captain said: “I don’t really know what I can say about it”. I can’t stop people having opinions and if people want to dress opinions up as facts, that’s a different thing. I am not really into facilitating people’s obsessions with things. “I am sure he is a nice fella. I’ve met him a couple of times and he seems grand, but he likes to be the centre of attention. “Honestly, it is water off a duck’s back to me. Some people take what he says seriously, I can’t help that either. County chairman Paul McArdle appeared on last week’s ‘The Sunday Game’ having asked RTÉ for a right of reply to counter some of Brolly’s claims and declare the county’s support for their team boss. When asked if he was aware of the move in advance, or had sanctioned it, McGeeney simply responded: “the county board are trying to do the right things”. “They have had a tough time over the past couple of years in getting the county back on its feet, paying old bills. McGeeney’s Armagh team play Laois in the first round of All-Ireland football qualifiers on June 18 in Portlaoise. Email “'I'm flattered by Joe Brolly's obsession with me' - Kieran McGeeney”. Feedback on “'I'm flattered by Joe Brolly's obsession with me' - Kieran McGeeney”.